This month has flown by, I actually can't believe that it's October tomorrow. We've been in the routine of school runs, after school clubs for a month now and as this is an expensive time of the year for many parents especially with school costs in general and Christmas just around the corner I thought that I would share my tips on how to budget and prepare for unexpected bills. Sometimes unexpected expenses come up. They just do. Out of nowhere, there is a bill you have to pay that you weren't expecting and now you are faced with an expense which may be putting a lot of stress on yourself and your family. Most things remain in our control, such as how much you spend on the food shop by disciplining yourself to only buy the essentials and not go over your weekly budget. But we can also be hit by the unexpected at other times. For example, your washing machine packs in or your car breaks down and needs costly repairs. Your laptop breaks and you work from home, the dog becomes ill and needs to be seen at the vets. The possibilities are endless. There are a ton of ways to save money and I've shared how I cut my food shop in half, but when you're broke and feel discouraged there's nothing worse than trying to live within your means and follow a budget. Get a part time job - This is probably the most obvious one, but see if you can get a part time job on the side or if you can pick up any extra shifts at your current job. Use cash back sites when shopping online - When I purchase anything online I now do it through Quidco (Ebates if in the US) as this give me money back on pretty much everything I buy. Sites such as Quidco and Top Cash Back are great cash back sites which you can leave running in the background and not check for months and realise you've accumulated £100s of pounds which come in handy if you have any unexpected expenses to pay for! Do some online surveys - There are many survey websites to use some of my favourites are Swagbucks and Inbox Pounds. They don't take that much time to complete and most of them pay out pretty quickly. Offer to babysit for friends - You can make some quick money for just a few hours each night babysitting. Freelance writing - If you're good at writing consider doing some freelance writing. Websites such as People Per Hour and are good places to start. You never know you may enjoy it and make a career out of it. Recycle your old phones - Have any old mobile phones lying around the house? Dig them out and see how much you could get in return for recycling them. Mazuma and Envirophone are both good websites for this. Dog walking - It may not sound like the most interesting way to make some money, however if you love being outdoors and love animals then this is for you! If you have a lot of free time during the day when others are at work then this may be a handy little earner for you. You can make around £7 an hour for walking a dog, plus its a great way to keep fit and you could even walk a few dogs at a time making more each hour! Switch your bills - I looked into reducing my bills by using comparison sites such as Uswitch and Money Super Market and managed to get my electricity and gas bill down by £55 a month as well as £45 off my Sky broadband and phone bill each month which means I can then put this money into a separate account to prepare for unexpected expenses. Sell items you no longer need - Have some items lying around the house or in the attic which you no longer use? Have a big clear out and see what you can sell. There are many places to see these days including eBay, car boot sales and local Facebook selling groups. Reduce your weekly food shop - Another great way of saving money is to reduce you food shop each week. I switched from top brands to supermarket own and also did my shopping online which helped to cut my weekly food shop in half as it meant I wasn't just throwing everything and anything into the trolley. I'd also recommend meal planning as this will help you keep you in the right mind frame and stick to only buying the ingredients you need for each meal. By reducing your weekly food shop spendings you will have extra money to put aside for emergencies. Take out a short term loan - If you are still struggling for cash and have no emergency savings saved up then taking out a short term loan could be a solution if money is tight. Vivus offer a one payment loan which means you pay it back all in one go when you next get paid. The intention is to lend to people who are careful with their money but have hit a bump in the road, but want to borrow for a short period of time and then pay the money back quickly and efficiently when they next get paid. 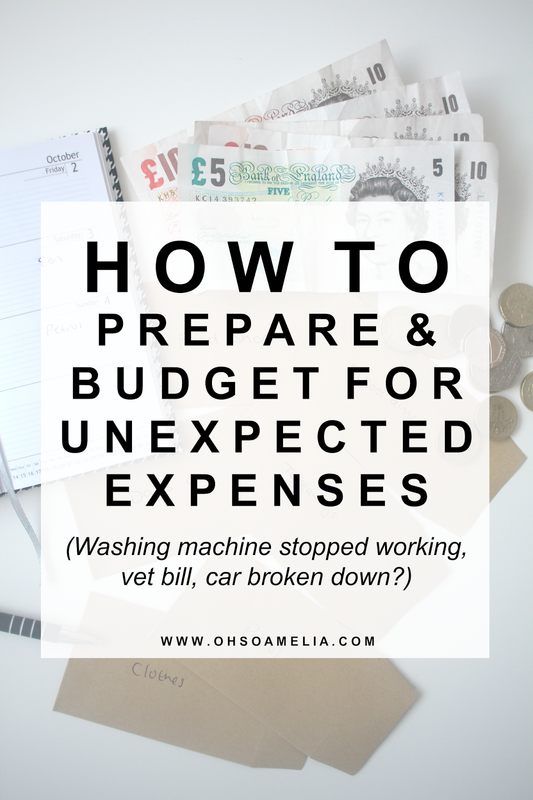 This would be very useful if your washing machine stopped working or the car broke down and you didn't have any money left until payday as we all know it's a nightmare being without a working washing machine with kids! Recently Which has said unauthorised overdrafts are more expensive than short-term loans which can in result see you end up in debt. Compared to other short term or payday lenders out there, Vivus offer a great deal especially as you can lend between £100-£500 and it will be easily affordable to pay back on payday. Saving challenge - Last year I started a money saving challenge and bought one of those pots you can only open with a tin opener. I have since opened it as I needed the money so get my car fixed but I did manage to save £500 in around 6 months just buy putting in a couple of quid a week or a £5 note when I had one in my purse. The 52 week money saving challenge is also a great way of saving money throughout the year and can be used for a holiday, Christmas or what ever you may be saving for but will also come in handy if you need it for any unexpected expenses. Build an emergency fund - It's always a good idea to start an emergency fund. Having an emergency fund can be useful if you have any emergency bills to pay or the washing machine breaks. So there you go, those are my tips on how to prepare for unexpected expenses. Do you have any to share? I could not agree with this more. I think the biggest thing is to be conscious of what you spend your money on and budget. I hate those unexpected expenses. They're the worst! I like to do many of these and I randomly hide dollar bills around my house whenever I have a few extra. I had to raid my stash this summer and I found 80 1 dollar bills in like 30 minutes. lol Not as cool as your money challenge pot but it works for me. These are great tips! I would love to be a dog walker on the side or work for a shelter.. but then I might end up a crazy dog lady with 100 dogs! Haha good post! Five percent of our pay check goes every month for unexpected emergencies. These are such great tips. You never know when an emergency will happen! These are all great ideas! Been in this sort of situation (husband's job loss), and it's amazing to discover what you can do without when needed :) Thanks! It is difficult to prepare for those unexpected expenses so thank you for sharing a practical list of things that people can do or change! Really informative read. Thank you. It is always nice to have spare cash, but can you give an advice on - how to motivate ourselves to start putting money aside before the unexpected expenses come.